I love stories of wild coincidences—and this story, written by Adam Hunter in a Guideposts e-letter, is about as wild as they get! Billion-to-one odds doesn’t do this reunion justice. Click here to sign up for Guideposts‘ free Mysterious Ways newsletter. You’ll also be able to download a free e-book, Mysterious Ways: 9 Inspiring Stories That Show Evidence of God’s Love and God’s Grace. Waikiki Beach wasn’t on their vacation itinerary, but Rick Hill, his fiancée, Maureen, and their three children—in Hawaii for a sunny week away from their Lunenburg, Massachusetts, home—decided to make a quick stop. When lives are at stake, do angels step in? This chilling story by Sheri Bull of East Moline, Illinois, was featured in a Guideposts e-letter. Click here to sign up for Guideposts‘ free Mysterious Ways newsletter. You’ll also be able to download a free e-book, Mysterious Ways: 9 Inspiring Stories That Show Evidence of God’s Love and God’s Grace. Her husband was away, the furnace was broken, and the front door was open. Did someone break in? Here in the Midwest, we’re used to frigid winters, but that morning seemed colder than usual. Maybe it was because my husband wasn’t sleeping next to me. He had gone out of town on a long trip. It was just me looking after our three daughters. We lived out in the country—no neighbors within shouting distance, and I felt vulnerable. At night I made sure to lock the doors and I prayed God would watch over us. Years ago, my good friend Al Autrey was rocking to Peace of Mind by his beloved Boston while he was tooling down the highway. When he heard the lyric, “Take a look ahead,” he took that as a sign to do just that. When he looked ahead and slowed down, he realized he probably avoided a serious accident. My friend Lori Anne Yang just had a similar experience. When I read about it in her latest blog post, my heart stopped and I said a silent prayer of thanks. Without further ado, here is Lori’s post. I have consciously resisted The Secret ever since it was released many years ago. Not that I knew that much about it. It just seemed, I don’t know, hokey. But recently, on the cusp of starting my new business, MAMASTE™, I’ve been filled with fear, doubt and anxiety. So I thought, “What have I got to lose by checking out the book’s message regarding the law of attraction?” I borrowed the book on CD from the library and threw it into my car so I could listen to it while driving. This weekend I sold a bed for less than I had hoped for, but I also got a great deal on an airline ticket back to Minnesota. When I told my mom about the plane ticket, she pointed out that getting such a great price made up for selling the bed so cheaply. Yep, the universe has a way of balancing the scales. So it was fitting that I just came across this story by Beaver Brown of Carmichael, California, which was featured in a Guideposts e-letter. Click here to sign up for Guideposts‘ free Mysterious Ways newsletter. You’ll also be able to download a free e-book, Mysterious Ways: 9 Inspiring Stories That Show Evidence of God’s Love and God’s Grace. I was at the bus stop, heading home after a long, busy night waiting tables at a steak house, when I realized I’d left behind my money pouch, with $70 worth of tips in it! I couldn’t afford to lose a night’s pay. I ran back into the restaurant. There was no sign of my money. Just imagine you had the night off, I told myself. I’d try to forget about it. You like “small world” scenarios? This one’s a doozy! Allow me to set the stage. 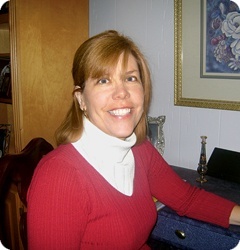 I am renting a room from Rozanne, a woman in Encinitas, California. I live here with Rozanne and her son, Chris, who’s a decade younger than I am. It’s a wonderful situation and we all get along beautifully. I love stories where two people inexplicably come together at just the right time in a way that defies logic. Case in point: This story by Elizabeth Pettigrew of Germanton, North Carolina, which was featured in a Guideposts e-letter. Click here to sign up for Guideposts‘ free Mysterious Ways newsletter. You’ll also be able to download a free e-book, Mysterious Ways: 9 Inspiring Stories That Show Evidence of God’s Love and God’s Grace. I had to pay off a loan but where was the money going to come from? I lay in bed one sleepless night tossing and turning. For months now I’d been trying to figure out how to pay off a personal loan of three thousand dollars. The only thing I could come up with was selling my ’98 Volvo station wagon since I no longer needed it. But I hadn’t had any luck with a buyer. It’s said that coincidence is just God’s way of remaining anonymous. Check out this story by Joy Sadler Wattenburger of Cushing, Oklahoma, and make up your own mind. It was featured in a Guideposts e-letter. Click here to sign up for Guideposts‘ free Mysterious Ways newsletter. You’ll also be able to download a free e-book, Mysterious Ways: 9 Inspiring Stories That Show Evidence of God’s Love and God’s Grace. An inexplicable coincidence convinces a grieving woman she still has something to hope for. They say God has a plan for everyone, but sometimes I wondered. Like when my husband died 11 years ago. Or when my mother and brother passed away a few years later. If it hadn’t been for my second husband, Jon, I don’t think I could have gone on. He came into my life just when I needed him, helping me get past my grief. But even he had trouble lifting my spirits the day in March when I waved goodbye to my oldest daughter and her children—my grandchildren—who were moving to Phoenix. Arizona was a long way from Oklahoma. Was I destined to have the people I love leave me? One person’s minor loss can lead to someone else finding something of great importance. This story, written by April Grube of Riverside, California, appeared in the August 2010 issue of Guideposts. A young woman on the verge of choosing a college has a life-changing experience that shows evidence of God’s love. I settled into my seat on the red-eye from L.A. to D.C.—a trip east to tour some college campuses before I had to make the big decision. The seat next to mine was empty and I couldn’t wait to get some sleep. Then I spotted a big guy maneuvering down the aisle, bumping passengers and apologizing profusely, and I knew—lucky me—I had a seatmate. Your angelic emissaries are with you always, guiding you with infinite wisdom and deep love. The implications of this realization are staggering. If God is guiding you with infinite intelligence and inexhaustible love, that means that nothing is random or accidental. Hold on to that thought the next time your grocery bag breaks in the parking lot, or you trip on the sidewalk and sprain your ankle, or your tire blows out a few blocks from home. Now and then I go about pitying myself and all the while my soul is being blown by great winds across the sky. Life has a way of delivering gifts to us at the precise moment we need them most. This story, written by Lorraine Arents of Fresh Meadows, New York, appeared in the June 2010 issue of Guideposts. I thought I lost my father all over again when I lost a keepsake. It had been more than three months since my purse was snatched from me on a New York City street. I had long since gotten a new purse and wallet, and replaced my credit cards and driver’s license. But even after all these months, tears still came to my eyes whenever I thought about the one thing that I could never replace: my father’s dog tags from World War II. I missed Dad so badly, particularly today as I sat at my desk catching up on e-mails from friends. If your calling has ever come calling for you, then you know how Richard Stearns of Bellevue, Washington felt when his destiny tapped him on the shoulder . . . again and again and again. Destiny is funny that way; it keeps knocking until you open the door. Richard’s story is a perfect example of the old adage, Coincidences are just God’s way of remaining anonymous. His story was printed in the March 2010 issue of Guideposts. When the phone rang in my office that morning, I had no idea how it would change my life. I assumed it was a business call. In some sense it was. The caller was Bill Bryce, an old friend from church. “Hi, Rich,” Bill said. There was something funny in his voice. “Oh, sure,” he replied. He paused. “It’s just that our president’s leaving World Vision.” Bill had moved away several years earlier to take a job raising money for World Vision, an international humanitarian organization. I was one of his first donors, but I still didn’t know a whole lot about the organization. I then requested and read the full manuscript and proceeded to call up the author and tell her I would “get into a monkey knife fight” to represent her. 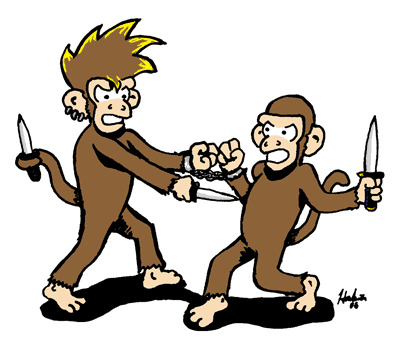 The agent’s “monkey knife fight” comment amused me; I didn’t recall hearing that phrase before. Whoa! Deja vu. I picked up the Writer’s Digest I had just been reading, flipped the pages until I found that first “monkey knife fight” reference and sure enough, the agent was Barbara Poelle, although the author was someone other than Lissa. Coincidence is simply God’s way of remaining anonymous, as evidenced by this story by Bonnie Kidder of Lafayette, Louisiana, which appeared in the September 2009 issue of Guideposts. I almost hadn’t come to the class at church that night. With four kids and a full-time teaching job, I had plenty to do. But my 11-year-old son, Brady, was having surgery the next day. I hated to think of him alone in the operating room. I’d been praying for weeks, asking God to be with Brady and his doctors during surgery, but it didn’t feel like enough. I had recently graduated from high school. One day, while I was in the laundry room downstairs, it popped into my head that I hadn’t talked to Mr. Moberg, one of my favorite teachers, for perhaps a year. 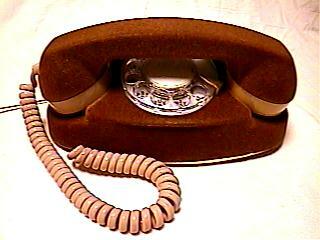 So I picked up the phone to call him but there was no dial tone. Yep, it was Mr. Moberg, calling me at the precise moment that I was calling him. I shifted in my seat—first-class because it was the only available spot on this leg of my trip home. The airline-reservations op erator had promised to get me there in time for Dad’s funeral, so she honored my bereavement ticket and gave me an upgrade. I pulled the faded newspaper photo from my purse and glanced at it. 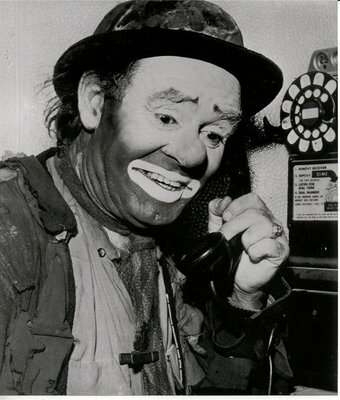 The famous picture of my dad, Emmett Kelly. Or should I say of Weary Willie, the sad clown that he had immortalized. Dad was disciplined about Willie’s public persona. 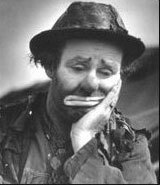 Once Dad put his makeup on, Weary Willie never broke character and never smiled, except once, back in 1955. That one time he smiled—beamed, really—a young photographer snapped his photo, and around the globe it went. The only time Willie smiled in public, the world smiled with him.